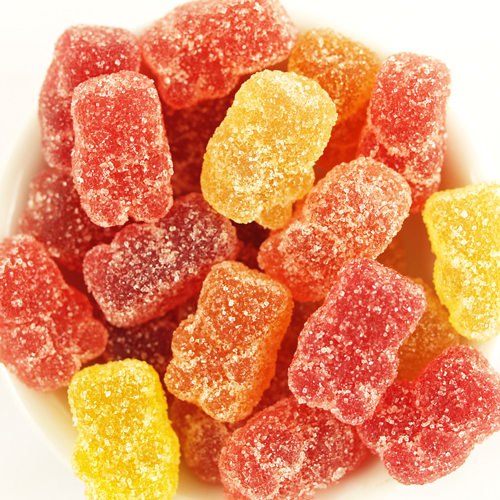 Vegan fruity bears are a tasty alternative to traditional gummy bears that come in 6 delicious flavors: cherry, grapefruit, grape, lemon, orange & strawberry. While they contain no gelatin, they still have a nice chew. Certified organic and now made without corn syrup. Click on 'Larger View" above to see packaging. Ingredients: Organic cane sugar, organic tapioca syrup, organic grape juice concentrate, pectin, citric acid, ascorbic acid, colors added (organic black carrot juice concentrate, organic turmeric, organic annatto), natural flavors. These Fruity Bears are awesome! My husband and son can't eat gluten, casein, or yeast and it is hard to find treats for them that are special. They both (and I do) love these fruity bears. They are organic and have no artificial colors - another big plus! They are sweet, soft and very flavorful! My kids and I love these gummies. It's so nice to have a gelatin-free gummie! A vegetarian blogger I read mentioned Surf Sweets and they are very hard to find in my area. These little gummy bears are worth hunting for. They have intense, true fruit flavors and are soft and chewy unlike regular gummies that are hard and somewhat flavorless.